When I was invited to represent Finland in the Nordic Pavilion of the DakArt 10 Biennial in Senegal, I thought this to be the right thing to take a further step in concretizing an idea that I developed already some years ago: to connect with African performance artists and to introduce them to the international performance art circuit. Presenting my work would inevitably lead to some response, negative or positive, either way helping me forward in my research on African performance art. From day one I went for it. Visual artist Mady Sima guided me around in Dakar to find a fitting biennial venue to do my performance. 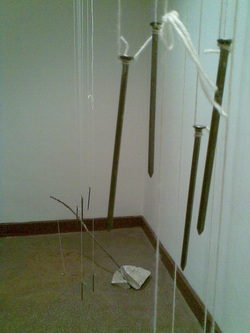 I had a clear image for an installation based performance that required the possibility to hang woolen threads with long nails attached. So I ended up finding the Musée Théodore Monod d'Art Africain the best venue for my work. So there I was, at the most prestigious place and time of the DakArt Biennial, to present my work under the watchful eyes of the Ministers of Culture and Information and many more officials. My performance was met with intense curiosity. I moved carefully with the nails on threads, what resulted in soft carillion-like sounds. Then I drew the contours of Africa in some sand on the floor and set between some stones a fishing rod with a piece of bread hooked on it. My actions were followed on a distance of one meter, a far cry from the "security zone" that is mostly piously established here in Finland. Performance art was obviously something totally new. Halfway my performance applause ended the concentrated attention of the audience and people came to congratulate me with my "great work". I felt frustrated and bewildered. Fortunately I found myself back in a fruitful discussion with Nigerian installation artist Ayo Aina. Another Nigerian artist, Jerry Buhari, told me about the evolving openness for experimental art in his home country as did Mr. Aina. He mentioned that despite the relatively late embrace of installation art it is now seen as embedded in traditional creative expression in Africa. The same could happen with performance art.